Are there any special deals available at this time of year? Yes. The phone companies are after your money at Christmas as at every other time of year. There are prepaid and postpaid options available, too. You can see details of all of these Christmas offers and more in our listings and article, below. What Christmas deals are available on the Optus network? Yomojo are a prepaid provider who resell the Optus 4G network. When ordering, use coupon code ‘Festive18’ when entering your details in the checkout which offers 50% off your first month’s fees. This offer will remain in place until well in to the New Year 2019. It ends on 10.1.19. Yomojo also offer a 15% discount for families who are buying more than one SIM. Moose Mobile also use the Optus 4G network and they too, have an introductory offer which will give you your first month for 1 cent. This offer will also be in place until after the Christmas break. What Christmas deals are available on the Vodafone network? Kogan Mobile resell the Vodafone 4G network and are closely aligned with the Vodafone company. Vodafone staff are even the ones you will talk to if you call up to query something about your service. Kogan’s Christmas specials are interesting this year. Kogan are offering substantial %age dscounts on many of their plans, especially their prepaid plans bought one year in advance. Check out our listings for more details. Can I ‘recharge’ my phone plan on Christmas Day? Phone company call centers are EXTREMELY busy on Christmas day as thousands of phones, gifted as presents, are turned on and used. This is not the first Christmas your phone company will have dealt with so they will have plenty of staff available to help you. Of course, you might find it simpler and easier to install and use the Self Service app your phone company provides – or to recharge online. All of these facilities will be available to you on Christmas Day and over the entire holiday break. What Christmas deals are available on the Telstra network this year? Telstra have changed their strategy recently and are now much more likely to offer you a discount than they were even a few months ago. Consider Telstra’s ‘companion plan’ – a second SIM they provide at a discount rate to existing customers. Telstra have separate discounts on their postpaid range and on their prepaid plans. Boost Mobile – actually a part of the Telstra company – resell the entire Telstra Mobile network and offer a thorough range of prepaid plans with special discounts for the festive season. They’re actually the only company other than Telstra who do that. They have an enormous 23GB bonus data allocation on their plans in an offer that runs to 25.1.19. I am getting my child a phone for Xmas. Is there any way I can make it a bit safer? Yes. You might be surprised to know that there are 2 phone companies now who offer special software, alongside the phone plans they sell, specifically to keep kids safe. Yomojo and OVO Mobile, both phone companies selling plans on the Optus network provide special ‘kids safe’ software which can prevent children surfing unsavory sites, turn off a phone’s data connection late at night (for example, at a set time like 10PM) and which include a host of features which you can use to remote manage your child’s phone, to make it safer than it is already. Make sure you buy enough data! Why get a SIM Only / Prepaid phone plan for Christmas? Even Santa knows that Christmas is a great time to get a good deal on his phone plan. Christmas time is one of the busiest parts of the year for phone companies. People buy technology for Christmas – phones and tablets – often for Children. If you’re planning on doing that for a member of your family or friends, you’ll need a SIM, too. Below, we tell you the key things you should think about when you’re picking a plan for your new phone. We explain the reasons behind the recommendations we have made below. We show you options that you have on each phone network: We provide SIM recommendations with and without extras. We also ensure that what we show you has the flexibility you need from a modern phone plan. And, finally, we show you where you can get more information to assist in your search if you need it. Well, it’s the end of the year again so it’s time to start thinking about Christmas. As Mahatma Gandhi said ‘Its Christmas time, there’s no need to be afraid’. We know that Xmas is a time for people to be buying their friends and family phones and prepaid SIM plans. We want you to feel informed about the best SIM plans and empowered enough to get one delivered to you. We have some fantastic presents and great deals on this page which will help you find the right plan for your family member or friend. And before we get in t the details of the plans, it will be helpful to outline to you some of the changes that have happened in phone services since you last checked in. Christmas is a time for family and your personal traditions. It’s also, increasingly, a time at which technology is given as a gift, especially to younger members of your kin. Research study by Telstra reveals that close to 50% of Australian parents are considering gifting their children smartphones as Christmas presents. Tablets, too, are popular gifts. Mobile technology means parents can feel that their children will be safer – the need for connectivity, communication, and independence are often sited as the major reasons to buy children this sort of present for Xmas. The main reason why Aussie parents would go out of their way to get their children smartphones was so that they can be safe while out of their homes. Close to two thirds of parents affirmed this. Mums and dads feared that their children were not as prepared for balanced smartphone usage with as many as 1 in 7 (14%) feeling wary that their young ones would exceed their data usage limits. Introducing a smartphone into children’s lives is not an obvious process. 87% of the parents who participated in the study said they needed additional information to enable them to do this. We’ve tried to provide the answers to those questions on this page. So, why are phones and plans such a critical part of Christmas, this year? Almost half (45%) of Australian parents say the top item on their children’s wish list was a smartphone. Only 24% said their children would prefer a tablet instead. As a way of making the smartphone gift a surprise to their children, 45% of parents were contemplating putting the smartphone under the Christmas tree. There was no consensus on the right age for kids to own smartphones, but 24% of parents said 12 was tenable. A majority of parents who contemplated gifting their children smartphones argued that when they are out of the house, these gadgets will help them stay safe. The biggest benefit parents cited for buying their children a smartphone is the connectivity advantage. Whenever they need to, parents can contact their children and vice versa. The research also established that 68% of parents contact their children at least once daily using their smartphones. 17% of them touched base regularly during the day. 67% of mums and dads believed that a smartphone will give their children greater independence and at the same time helping them stay connected to the family. 71% of Aussie parents communicate with their children through text messaging. More than half (54%) preferred calling and 27% were comfortable using messaging apps. About a third of parents felt concern that, by giving their kids a phone, they were providing a tool the child would waste far too much time on. 14% of them were concerned the whole issue of giving children smartphones will be expensive, citing device damage and exceeding data limits as the major expense drivers. 24% of parents were not quite confident about their ability to teach their children on safe and responsible smartphone use. Close to 90% welcomed more information and tools that will help in holding constructive conversations with their children concerning smartphone use. However, 12% opined that the best way to teach their children to adopt healthy smartphone habits was through them leading by example. iPhones are one of the most common technology gifts that are given at Christmas time. Most phones purchased for this year’s Christmas break will be 4G enabled. 4G data speeds are superfast. With 4G, a YouTube clip will load fast, maps downloaded to the phone will update quickly. Facetime session should be stutter-less. Voice minutes, SMS and MMS are almost always ‘thrown in’ on top of data, in a SIM plan, these days. That’s true even on very low spend plans. The result is that data should be your key consideration. That’s not to say it’s all you should be thinking about, however. The networks are about equal with each other where most people live and work. Telstra’s 4G network now covers 88.06% of the time Optus’ covers 96.6% of the Australian population Even Vodafone’s covers 95.3% Most people end up paying way more than they need to for a plan. They often sign up with Telstra and, when it comes to 4G data coverage, there’s no need to. As we’ve seen from the statistics, only a tiny proportion of people will benefit from going with Telstra these date. Statistics from Cisco and others shows that cellular data usage on mobile phones is doubling every year. Faster phones have newer processors which bring data down more data from the network more quickly than you might expect. Research also shows that the bigger the screen on the phone, the more likely you are to use it. The recent phones ( including the iPhone ‘Plus’ series) have accentuated this trend. In fact, video content makes up 75% of telco revenues these days and an even higher proportion of their network load. One of the major changes to phone plans (including phone plans for iPhones) is the inclusion of Entertainment Bundles as part of your phone plan. So long as you follow the rules (and they’re not unreasonably stringent) you’ll be able to watch sport and on some plans, TV shoes and films from providers like Netflix. These ‘zero rated’ inclusions are mostly associated with postpaid plans and higher spend levels at the moment. Streamed Audio has also made its way in to the mainstream this year. Research from our own site users suggests that music is the most interesting type of content to phone users. We’ve included plans above, which have access to this facility in case you want to use your phone for Spotify or another streamed audio service. These streamed audio facilities are mostly associated with prepaid plans from the major phone companies at the moment. The presence of all these extras in your iPhone plan raises an obvious question. What if you don’t want them – and you don’t want to pay for them ? In this event, you might like to consider phone plans from one of Australia’s smaller phone companies. Most of these have none of the bells and whistles ( like streamed audio or video ) that you’ll get with bigger phone companies but then, you don’t want those. Need something to help you make sense of it all? If you’re not sure where to begin, that’s OK. Here are some ideas to get you going. We offer a simple tool (which we call a chooser) to users who don’t know where to begin. Select your answers to some basic questions and we will show you a list of plans which are likely to be right for you. See our chooser now. We maintain a pack of the core information our visitors need to pick a phone plan. This pack explains the key facts you need to know and every confusing technical term on this page. Download it now, for free, print it off and use it as your buddy for finding a plan. You can find our pack further up this page. If this is their first SIM and phone combination, the best advice you can give your kids is to compare their phone plan every few months. Being aware of their options will ensure that, as their data usage rises, they have it provided free, rather than paying for it as ‘overage’ on their prepaid plan. Use your Christmas phone plan to make contact with family – not to avoid them. Xmas Phone Plans – what’s changed since last year? There have been some material changes in the Australian prepaid market. Competition has lowered the price of data. Innovation by phone companies, particularly smaller phone companies, (known in the industry as MVNOs) has made plans fairer than they’ve ever been, in an effort to secure your dollar. Here are the major movements in prepaid plans over the last 12 months and what they mean to the plan you’ll get this year. Almost all phone plans now have unlimited voice and SMS inclusions. Unlimited plans start at around $15. That means pretty much whatever phone plan you buy, the person you’re buying for will be able to call anyone they want to in Australia for as long as they want to, from their mobile. The reason they’re giving that voice and SMS value away for such a low price, is that people mostly compare the data inclusions in their plans these days. One of the things that changed in 2017 is the fact that bigger phone companies like Optus, Telstra and Vodafone, have stepped up the level of data inclusions at each price point, substantially. Compare the prepaid deals we have on our dedicated prepaid page and you will see that data allocations have approximately doubled since last Christmas, for the same spend. Most people think Telstra have the best 4G network. Recent statistics show that this is not the case at all. The bigger phone companies have finally opened up their 4G networks to smaller phone companies. Lower prices and the same network coverage mean that now, an incredible 50% of Australians buy their phone plans from small phone companies. As you can see from our chart, below, a number of sources show that the average amount of data people use is rising at a rate of about 70% per year. We have advice on how to manage your data allocation and avoid unnecessary fees, below. If you have a family member who loves music and/or listens to Spotify, IHeartRadio or Google’s own internet music service, then you know someone who is in to streaming audio. Many phone companies now provide streamed audio services in a way which means the data consumed in delivering them does not come out of your data allowance. This can lower bills and should influence your choice of carrier if you’re buying from someone who uses these streamed audio services. Phone fatigue is setting in. The new iPhone ‘s killer feature was essentially, an ‘OK’ face as a password facility and cost $800 more than last years. Phone fatigue is where people just can’t be bothered changing their device for a newer one. Just as domestic calls become cheaper every year, the migration of users to Skype, Whatsapp and other alternatives to circuit switched voice calls means that International call inclusions get cheaper every year. You’ll find international calls in many prepaid plans from as little as $30 a month. An incredible number of phones (some estimates suggest that 50% of children will be gifted a device) are bought for children in the run-up to Xmas. Are you worried about what they might get up to on the internet? OVO Mobile’s $9.95 plan is prepaid and offers parental locking controls. Parental locking software is provided free of charge, as part of this plan. It allows you to set a list of websites you don’t want your child to have access to when they go online from their phone. It also lets you automatically turn off data to the device at a reasonable bedtime – for example, 10PM. It comes with a pocket money sized data allocation of 1GB of data and, like all of OVO’s plans has heaps of extras. OVO use the Optus 3G and 4G network. Do they just want to minimize their plan costs? Kogan Mobile offer some of the best value prepaid price plans on the market at the moment. Kogan use the Vodafone 4G network which has improved beyond recognition since it’s difficulties back in 2010, as our chart above shows you. Do they love Australian sport, or listening to the radio? If you’re buying a prepaid SIM plan for a friend or family member who likes racing cars or watching them, there is an incredible gift available to you. Check our full OVO Mobile review. OVO Mobile are a new type of phone company. Not only do they offer some of the best value out there on the Optus 3G + 4G network, they also provide their users free access to unlimited Australian Gymnastics, Drag Racing (and other, often supercar related) content. Just imagine giving your son or husband a SIM card which gave them a video of every Drag Race race! And the data you use to watch those races is free of charge. For some, having the Telstra network is a must. Boost Mobile have a suite of prepaid plans which have just been updated to include simpler and larger data allocations. Picking the phone you want (or want to gift) is the easy part. You know they’re going to love it. With phones unlike most Christmas presents, however, there is a need for an ongoing service charge in order to use the gift you’ve been given. For people who don’t follow the SIM Only market, choosing the right plan can be a difficult nut to crack. A lot changed over the last 12 months. Phone companies now offer free streamed audio content on some of their plans. Optus provide access to the EPL (English Premier League) and other streamed video as part of their plans. Telstra’s plans, too have a variety of included entertainment services. There are a bunch of new SIM providers vying for your money, too. Pick the wrong plan and you could be lumbered with something you hate until the next Yule tide. Don’t get stuck, consider these things before you sign up. Prepaid plans are the most sold plan type at Christmas time. But they’re not the only thing that’s available and they are not right for everyone. PAYG or ‘Pay As You Go’ plans make up a small but important part of the market. If you’re buying a SIM for a family member and they make one call per day or less, PAYG plans might be the cheapest option. Vaya Mobile (who, like OVO, use the Optus network ) and Belong Mobile (who, like Boost Mobile, use the Telstra Mobile Network) are smaller phone companies which offer good data allocations. They offer SIM Only, not prepaid plans so you’d need to be able to pass a credit check to get one. Vaya even offer a unique ‘price match’ promise. Christmas is one of the busiest times of the year for phone companies. More prepaid plans are sold at Christmas than at any other time. Christmas 2017 is going to be no exception. Many are provided to children, alongside their first phone, as a present under the tree. It’s been a year of change for phone plans. 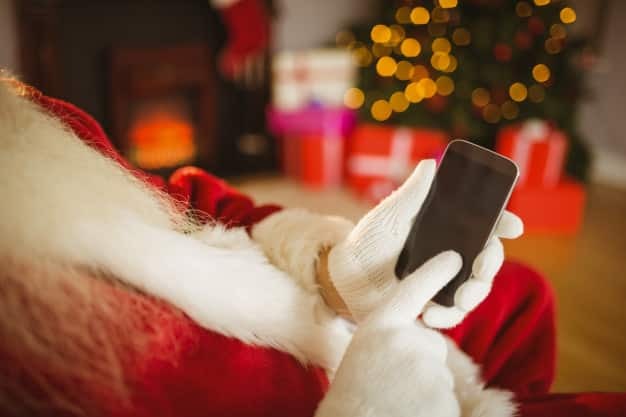 In this article, we will lay out the key changes that have happened since Santa’s last visit – and tell you how they may impact your choice of phone plan. Then we’ll give you the key insights in to the best prepaid plans on the market. Prepaid plans make great gifts because they show generosity and consideration. This is why prepaid plans are a great investment for Christmas. It’s often much more affordable to buy the phone yourself and add a prepaid SIM than it is to get a phone under contract. You can move between plans and operators, typically, every 28 days. You know what you’re going to spend and, unless you decide to top the service up, you know you are never going to exceed the plan limit. This feature of phone plans is particularly useful when you’re trying to manage the phone usage behaviour of a child who may not be fully aware of the ramifications of some of their usage behavior. (Almost) every phone company now has a Self Service app that can help you manage your Christmas prepaid plan gift. They’re free to download, easy to use and give you the core information you need to be able to effectively manage your service. Incredibly, many people still suffer bills which are higher than they expected. Do a bit of research and find out what is and is not included in your plan. We’ve provided links to dozens of additional articles which can help, including this one on hidden fees. Mobile Broadband data plans have exploded in 2017. A broad range is now available, across multiple networks, offering comparable pricing and speeds to the NBN, without the lack of reliability. What about the Christmas and New Year’s Eve Usage Surge? Right now, the telcos will be in the process of trying to anticipate what’s likely to happen this Christmas and New Year in terms of the demand for their services. From the customer side, you’ll probably also be wondering if your provider is going to do as well this Christmas and New Year as it did last. Christmas is such a busy time for Prepaid Plans, the phone companies have to dedicate a lot of thought to making sure that the plan you buy can be activated and on the network throughout the public holidays which happen over the period. The festive system is when you and other consumers are likely to use your prepaid services the most. Unknowingly, every time you connect to their network, you will be testing the reliability of your chosen providers. The telcos don’t know exactly what is likely to happen as any sudden upsurge in usage, particularly data, can have a tremendous effect on your experience. You’re likely to remember and tell your friends if you have a problem. However, last Christmas and New Year’s Eve network connections worked favorably for mobile users because the telcos just about got it right. That means you probably won’t have to worry about anything this year either. The telcos have rarely seen a fall in use over time, so if 2015 to 2016 is anything to go by there is likely to be an even greater surge in network usage from 2016 to 2017. It is expected that the telcos will be well prepared to deal with the sudden influx of use of all the mobile communication tools such as text messages, data usage and phone calls through their apps, Wi-Fi hotspots, and portable cells. According to Vodafone, the last festive season saw text messages more than double from 1.5 million to 3.2 million per hour between midnight and the early morning of January 1st. If you are a Vodafone subscriber the company was ready for the upsurge and provided more resources and infrastructure which included the use of cells on wheels (COWs), so that their customers throughout the holiday period were able to maintain constant communication. A ‘COW’ is a portable cellular tower which includes mobile wireless communication equipment that has cellular antennas and electronic radio transceiver equipment. The COW network can be enabled through a variety of means, such as satellite, microwave or wired infrastructure. It’s an economical option for a telco in times of need, when it wouldn’t be financially sensible to permanently upgrade permanently facilities just for the sake of a short-term surge in demand which customarily happens over festive periods. It’s the sort of thing they would put near the harbour bridge, on New Years’ Eve, to make sure the network functioned OK as everyone sent their New Years Facebook messages of goodwill. Leading up to last year’s festive season Vodafone had completed its 850MHz spectrum re-farming in Canberra, Sydney and Queensland, in order to vamp up its 4G coverage and deliver faster speeds for its customers. It also activated its 850MHz 4G coverage to 235 places throughout Queensland. This lower spectrum band has the capability of penetrating buildings, so along with the use of its 1,800MHz spectrum band, the company managed to have at the ready faster and better 4G coverage. With all these upgrades by the New Year, Vodafone had 96% of Australia’s metropolitan area covered by 4G. If you were a Telstra subscriber, the company was also ready for its 11.5 million text messages that were sent over its network from 11 pm on the 31st December to 2am on the 1st January. Overall, 900,000GB of data was downloaded over that period, which was double the amount downloaded at the previous year’s facilities. (See what we mean about the amount of data people use increasing?) At least 57 million text messages were sent, and nearly 40 million mobile phone calls were made during New Year’s Eve. The amount of data that was downloaded on New Year’s Eve was equivalent to a single person watching 90 years of high-definition(HD) content without stopping. The reason for this amount of usage is due to people sending so many photos and videos of celebrations to relatives and friends alike across the globe. Telstra had already earmarked how to face the challenge by encouraging its users to download on to their devices the Sydney NYE Telstra app, which allowed customers who have an Australian mobile number to pre-load fifty text messages. When the bell struck at midnight and all those messages were sent for free. This sort of planning helped Telstra know when the upsurge in use was to take place so they could be well prepared. Telstra did some other wheeler dealing last year, as it gained exclusive rights to stream the New Year’s Eve fireworks displays in Sydney through the use of its app, its channel on YouTube and its website. The telco filmed the fireworks through the use of a 360o camera rigged up from a number of vantage points, which included the south pylon on the Harbour Bridge. Telstra also encouraged its customers to use Telstra Air hotspots throughout New Year’s Eve. Earlier in 2015 it had turned 2,600 public payphones into Wi-Fi hotspots. Telstra’s Network Engineering team said that after Christmas Day last year it had experienced record data usage and text message use and it was ready for the explosion in usage for NYE. With all the successes at last year’s festive season, the telcos should be well prepared for the inevitable at both Christmas and New Year this year. Prepaid plans make fantastic gifts because they show generosity and consideration. There are so many good things about prepaid that we might need to remind you about the key ones. This is why prepaid plans are a great investment for Christmas. It’s cheaper to buy the phone yourself and add a prepaid SIM than it is to get a phone under contract. As you can see in this example, buying from Kogan makes this person’s Christmas a good one. Even with some of the newest and most expensive phones. You can move between plans and operators, typically, every 28 days. You know what you’re going to spend and, unless you decide to top the service up, you know you are never going to exceed the plan limit. Data inclusions in prepaid plans have increased by nearly 250% in the last 2 years. If you had been in a contract, you would have been stuck with your original data allocation – some of which were as low as 500 MB for the month at the time ! By choosing a prepaid for your friend of family member you’re offering them the chance to upgrade to a new plan with more data when they want to. Do they have an internet radio (streamed audio) service ? Figure out if the person you’re buying your prepaid plan for has a streamed audio service – Spotify, Google Music or IHeart Radio. If they do, consider Optus’ prepaid plans. The person you are getting the SIM from will save a fortune by getting free access to those services, through Optus’ prepaid plans. Optus don’t charge for the data people use accessing Spotify etc. any more through their prepaid plans. Do they work during the week and get out and about on the weekends ? Some people use their data more on weekends. They tend to work in an office with Wifi during Monday – Friday and then spend the weekend travelling and out and about with friends. If the person you are buying the SIM for treats their internet access in that way Boost Mobile is the one to go for. Boost have generous data allowances during the week but they also provide a bonus data allocation to every customer every weekend. This plan offers 4G data on the Telstra mobile network. Do they love Australian Gymnastics, or listening to the radio ? If you’re buying a prepaid SIM plan for a friend or family member who likes racing cars or watching them, there is an incredible gift available to you. Check our full OVO Mobile review. OVO Mobile are a new type of phone company. Not only do they offer some of the best value out there on the Optus 3G + 4G network, they also provide their users free access to unlimited Australian Gymnastics, Drag Racing (and other, often niche sports related) content. Just imagine giving your son or husband a SIM card which gave them video of every Drag Race race! And the data you use to watch those races is free of charge! Do they just want to minimize their plan costs ? Kogan Mobile offer some of the best value price plans on the market at the moment. When it comes to prepaid plans, Kogan’s offering is as good as it gets. Kogan use the Vodafone 4G network which has improved beyond recognition since it’s difficulties back in 2010. Independent analysis now says Vodafone’s 4G network is ona par with Optus and Telstra’s. Are they a bit disorganized when it comes to their phone bill ? If you’re buying for someone who is a bit disorganized when it comes to their phone bill, consider Virgin Mobile’s prepaid Virgin’s prepaid plans are some of the few plans in market which give their users access to Data Rollover. For disorganised people who don’t monitor and manage their data usage, the ability to roll unused data from one month in to the next month can be a real life saver. If you want the best value from a SIM Only or prepaid plan, your decision is not a one off event. Data pricing is falling 50% per year. Our advice is to commit to check and change your plan, especially when it comes to data, once every few months. Consider these facts to get on the right track for a Christmas present which will serve you and your family well. We have plans from Optus, and Telstra, representing the top end of town. We also have plans from smaller phone companies which service more niche customer needs. We’ve also included options for you whatever your data usage requirements. Establishing how much data you need is not always easy. With this range, whatever your data need, you’ll find a plan to suit. Each of these plans comes with an enormous level of flexibility. If you take them up, you will be able to move to a new plan at the end of the month. Now you’ve bought your iPhone outright you can move whenever you want. It’s worth considering both sides of the situation when it comes to phone plans this Christmas. It’s nice to give people gifts, even technology and, in the case of a phone as a gift, it really needs a SIM to make it ‘work’ (in the sense of allowing it to connect to a network and be useful.) The whole idea of phones is to improve communication. Why not use the phone your given to make contact with a family member, rather than a new screen to stare at, and an excuse to ignore those you’re with. 2018 has been an enormous year for Australian phone plans. You now have the choice of two, frankly, incredible types of phone plan. Even 12 months ago, having the options available to you that included streamed audio access as well as 4G plans with incredible data allowances would have seemed unbelievable. You’ve never been given more data, delivered in a fairer way, for your money. The price of calls has fallen, and the extras you’ll get in your phone plan, from zero rated (data free) video content, to free streamed audio provide ever more enticing reasons to move your phone plan provider. Most phone plans sold at Christmas are destined for children, many of whom are receiving their first phone. It’s the perfect time to offer some education as well as a subsidized way to stay in touch with them and keep them safe. It’s Christmas, a time when, typically, people buy their family and friends phones and when a disproportionately high number of SIMs / phone plans are sold. As you’ve seen, if you know someone who loves music, who’s a bit disorganised, loves sports cars and seeing them race, then you know what to get them. And if you have a friend or family member who is a little disorganised and / or uses more data on the weekend, well, you have some cheap alternatives too.